One of the most important relationships any child can have is that with their grandparents. Especially in today’s society where often both parents work full-time, grandparents more and more are becoming primary caregivers and responsible for raising the children. However, relationships with parents can often become strained following a divorce, limiting a grandparent’s access and time with the children. As a grandparent, what are your rights to visitation in this scenario? As a parent, can you limit your children’s exposure to grandparents that you view as potentially harmful influences on your child’s development? At The Law Office of Del Sardo & Montanari, we are prepared to help families effectively resolve these difficult issues. Our family law attorneys have already worked with many clients across Wayne, Clifton, Little Falls, and Passaic County, and we are ready to put our knowledge, experience, and compassionate service to work for you today. New Jersey is traditionally one of the most progressive states when it comes to grandparent’s rights to visitation. New Jersey’s first legislation regarding grandparent’s rights to visitation (N.J.S.A. 9:2-7.1) was enacted in 1972, amended in 1973, and amended further later in 1993. While this legislation recognizes a grandparent’s rights to visitation, an extremely important New Jersey Supreme Court Ruling in the case of Moriarty v Bradt is what determines exactly how grandparents must go about petitioning for the right to visit their grandchildren should said visitation be denied by a parent or parents. Based on this ruling, grandparents must now prove to a court exactly why and how being denied visitation with their grandchildren is actively harming the child or children in question. This stricter standard is due to the recognition of a parent’s fundamental rights (parental autonomy) when it comes to raising their children. 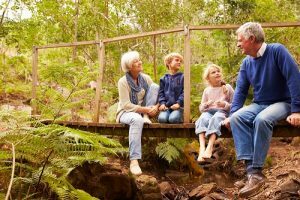 If you are being denied visitation with your grandchildren, you have the legal right to petition the courts to grant you access and regular visitation with your grandchildren. As previously noted however, you and your Passaic County Grandparent’s Rights attorney will need to be able to demonstrate exactly how or why being denied visitation with your grandchild is actively harming the child or children in question. As you can see, a great deal goes into a visitation petition by a grandparent. Retaining the counsel of an experienced Passaic County grandparent visitation attorney during this process can be extremely beneficial, as your attorney will be able to effectively present all of the supporting arguments to the deciding court, and help you demonstrate your history of regular, close contact with your grandchildren and the positive affect this contact has had, and will to continue to have, on their lives. The reason that a grandparent must go through this exhaustive petitioning process to gain visitation rights with their grandchildren is due to the fact that our laws recognize that parents have the fundamental right to deciding what is best for their child. Parental autonomy is important, and if you have reason to believe that visitation between your child and a grandparent is harmful to the child, you have the right to deny said visitation. Should this right come into question by a visitation petition, it is important to be able to demonstrate exactly how and why you believe contact between your child and the grandchild petition for visitation would be harmful to the child. It is highly recommnded that you retain the counsel of an experienced Passaic County child visitation attorney during this process to help you communicate your concerns to the deciding court, and do so in a proper and effective manner. At The Law Office of Del Sardo & Montanari, our attorneys have extensive experience helping clients across Clifton, Wayne, Little Falls, West Milford, and the greater Passaic County area with all manner of child visitation issues. Whether you are a grandparent being denied visitation with your grandchildren, or a parent who is concerned about a negative relationship between your child and a grandparent, our attorneys are prepared to thoroughly review your case, and present compelling and effective arguments on your behalf. We believe in providing attentive and personal service to all of our clients, and strive to ensure our clients are highly informed and involved throughout any legal process. To speak with our family law team today in a free and confidential consultiation regarding your grandparent’s rights to visitation issue, or any other family law matter, please contact us online, or through our Clifton, NJ office at (973) 233-4396.